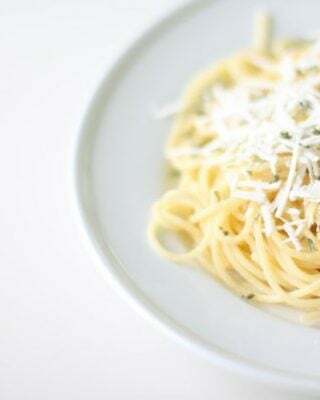 Light and flavorful three ingredient Aglio e Olio, a traditional Italian dish! The perfect weeknight dinner made with pantry ingredients in just ten minutes. Aglio e Olio has long been a favorite Italian pasta dish of mine. It’s all I can do to make that g silent when ordering it off the menu. It is pronounced AH-lloe-OH-lee-o and simply means garlic and oil. 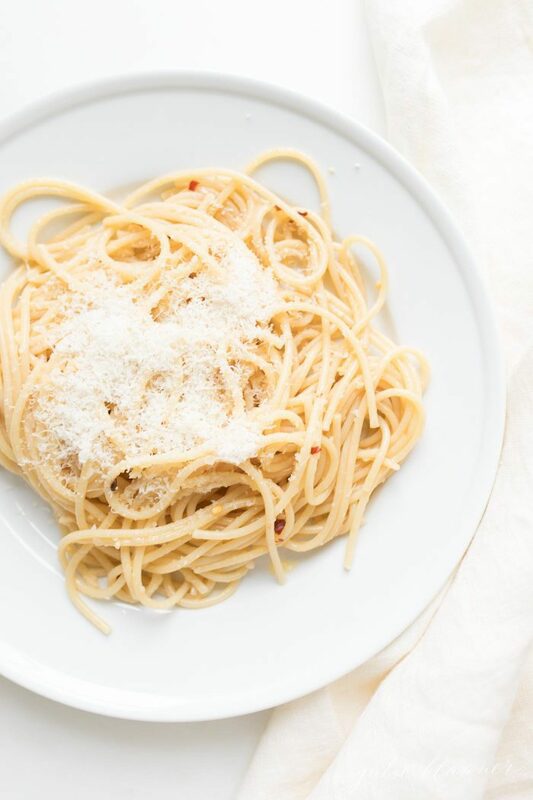 That’s just what this simple dish is – olive oil and garlic with a little dash of red pepper and fresh grated cheese! It’s simple to make and with just three staple ingredients it’s still full of flavor. It’s that dish you get excited to make when you realize you don’t have any groceries! I consider Aglio e Olio adult buttered noodles. A more sophisticated taste but with beauty in all it’s simplicity. It’s perfect on a hot summer night or on a cold winter day. 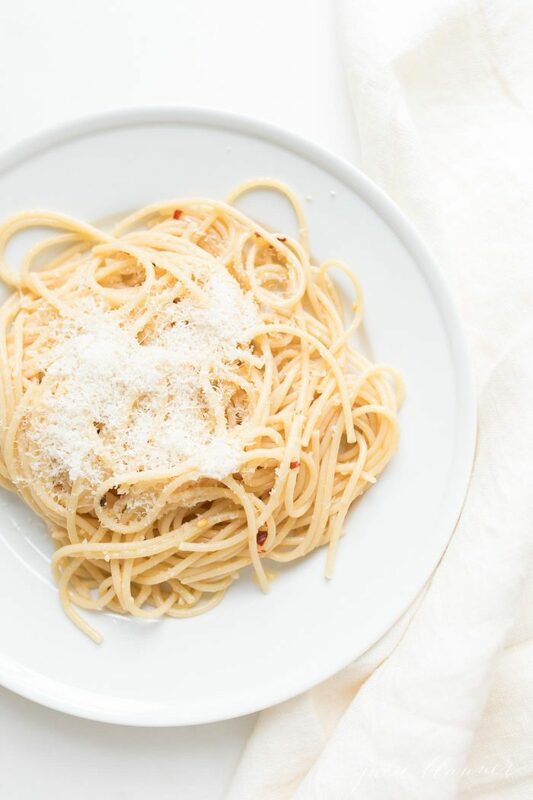 Aglio e Olio is a great 10 minute pasta dish that costs under $5 to serve a family of four. It largely uses staples already in your home! It’s a perfect stand alone dish, but you can toss in shrimp, scallops, baked chicken breast or anchovies! For a rounded meal, add a classic Italian salad and serve with fragrant garlic bread. YUM. I’ve made this recipe so many times through the years. 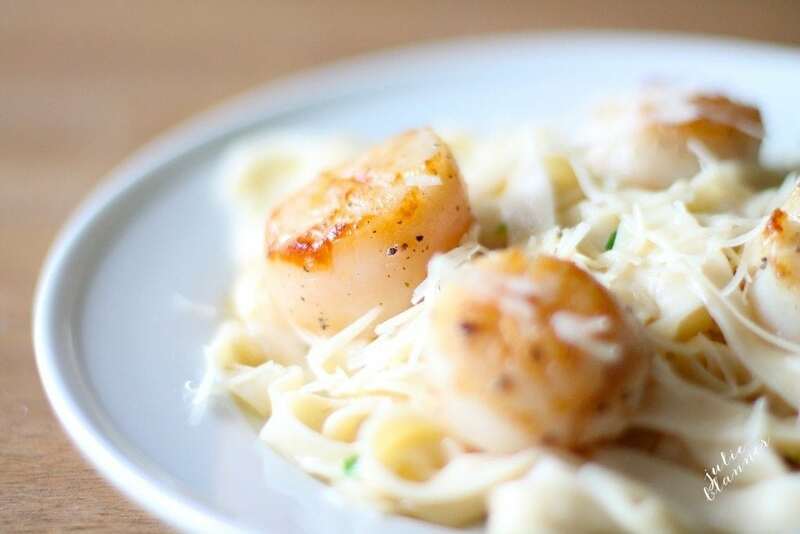 Below you’ll see this simple pasta dish with scallops from several years ago – Chris’ favorite way to enjoy it! 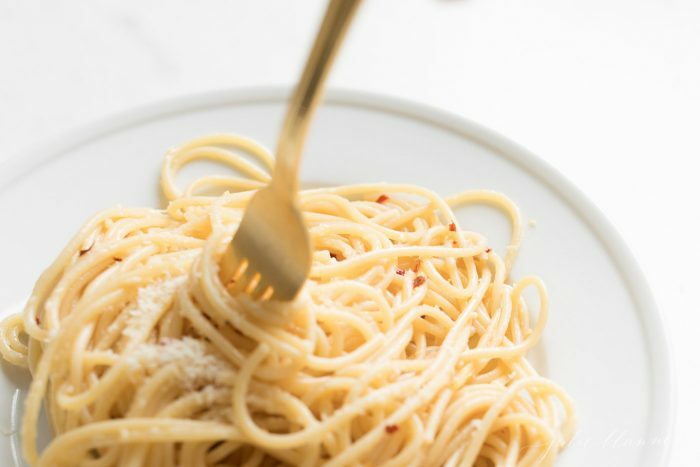 Named after two of this dish’s most important ingredients, garlic and olive oil, this simple pasta is also made with dried peperocino or dried red pepper. I like to toss it with homemade egg noodles, but box spaghetti does the trick, too! As Ina Garten often says, use “good” olive oil. Of course any olive oil will work, but with just a few ingredients the oil really stands out. This is the perfect time to use that bottle you’ve been saving from a trip to Napa, a nice bottle you picked up at your local spice store or just an elevated bottle from your grocer. You can use fresh garlic cloves, but I always opt for minced garlic available in your grocer’s produce section. 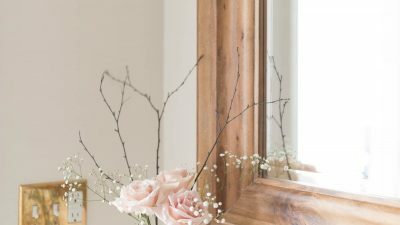 It’s a staple in our home and one of my favorite shortcuts! I should mention Aglio e Olio sauce is so amazing on fresh vegetables as well! Sauté green beans or asparagus in any extra sauce for a memorable side dish. It’s dairy free and you can make it gluten free by using gluten free pasta. Voila! Something for everyone! In a sauté pan over medium heat, warm olive oil. Reduce heat to low and add minced garlic. Brown it, stirring continuously for about 60 seconds. It brings out the flavor of the garlic. Careful not to overcook as garlic can become bitter when burned. Add red pepper flakes and remove from heat. Toss drained pasta in garlic and olive oil. Plate and garnish with fresh grated parmesan or pecorino romano. I like to save a cup of the pasta cooking water in case the pasta sauce needs to be thinned out a touch. Leftovers can be stored in an airtight container, refrigerated for up to 5 days. A little Italian parsley goes a long way in giving this dish some extra color. I like to add fresh parsley after plating the dish so it doesn’t interfere with the simple flavors of this sauce as it cooks. 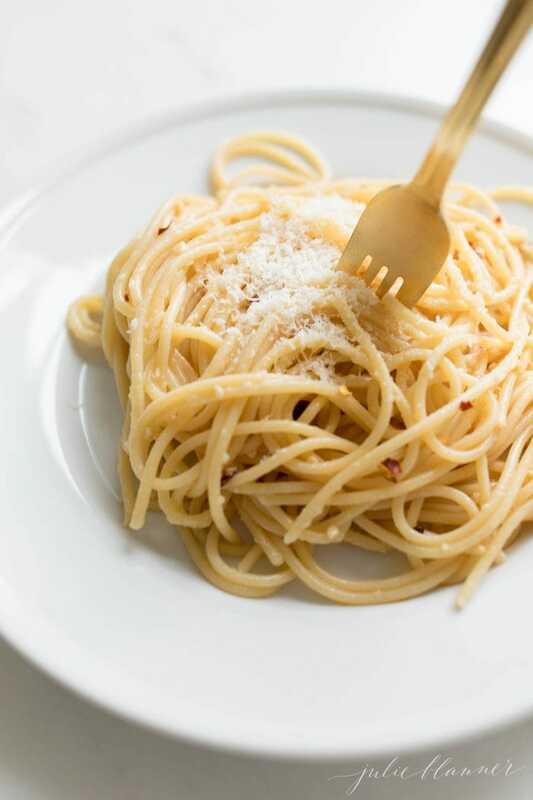 If you like this aglio olio recipe, you’ll love my other favorite pasta dishes! 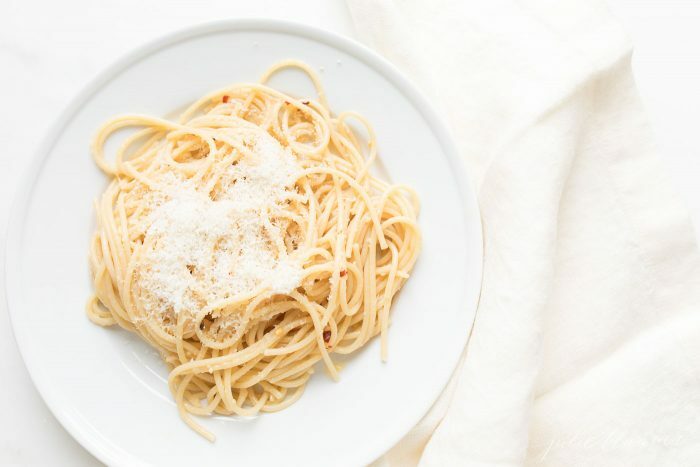 Is Aglio e Olio Healthy? 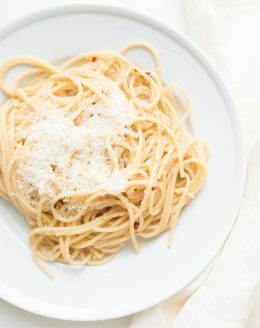 You can make this pasta dish a little healthier using whole wheat pasta (or a veggie noodle if you’re really aiming for a low-carb veggie dish) and adding a protein like anchovies, baked chicken breast, scallops or shrimp. You can even toss in spinach for added flavor and vitamins and minerals! It comes it at just 425 calories per serving. To see just how easy Pasta Aglio e Olio is to make, watch my YouTube video embedded in this post. 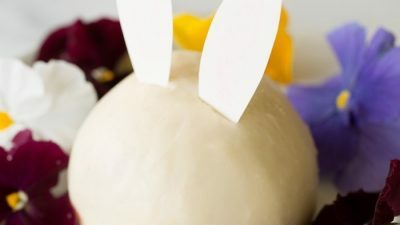 Don’t forget to click subscribe for more easy recipes! 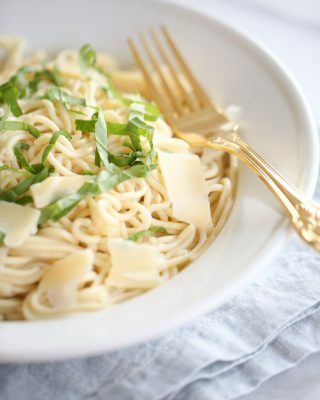 Light and flavorful three ingredient Aglio e Olio, a traditional Italian dish! The perfect weeknight dinner made with pantry ingredients in just ten minutes. 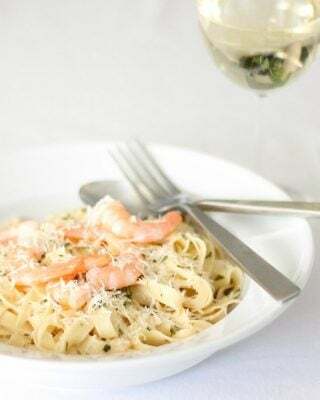 Pasta Aglio e Olio is amazing on it's own or tossed with scallops, shrimp, anchovies, chicken, veggies and more! Bring a pot of salted water to a boil and cook pasta al dente. In a medium saucepan, add olive oil and dried peperocino / red pepper. Sauté for 1 minute. Add minced garlic. Cook for 1 minute or until golden, careful not to over brown. Add up to 2 cups pasta water and reduce for 3 minutes. 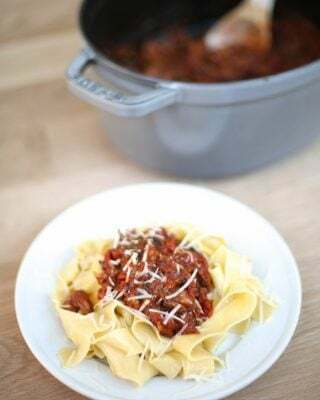 Toss pasta in sauce top with fresh grated parmesan or pecorino and optional fresh parsley. Originally published August 2014, updated March 2019. Oh this recipe is such a favorite of mine! Classic comfort food. Thanks for sharing!